Marilyn SanClemente March 7, 2014 March 7, 2014 Mojo Monday Sketch Challenge, Sale-a-bration, Specials, Spring, Stampin' Up! This week I am trying out the Mojo Monday challenge which I haven’t done before. I love sketch challenges since you can use any stamp set and designer paper and it is fun to see everyone’s interpretation of the sketch! Here is the sketch for this week’s Mojo Monday. I used all Sale-a-bration items this week. The Designer Paper is the Sweet Sorbet from the Sale-a-bration catalog. The stamp set is You’re Lovely which is my favorite set from Sale-a-bration this year and the embossing folder is Decorative Dots. Here are all the details for my card: 1. The background is a half sheet of Pistachio pudding card stock cut in half at 5 1/2″ and scored at 4 1/4″. 2. 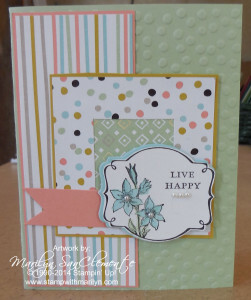 I embossed this card base with the decorative dots embossing folder. 3. The designer paper is from the Sweet Sorbet pack. The stripped piece is 5 1/4″ x 2 1/8″ layered onto a piece of Crisp Cantaloupe Cardstock that is 5 1/4″ x 2 1/4″. 4. The dotted designer paper in the middle is a 3×3″ square. I measured in 3/4″ on each side and cut out the center to make a frame! The Pistachio designer paper in the center is the reverse side of the dots! The frame is layered onto a 3 1/8″ square of Summer Starfruit. 5. The image is stamped with black Staz-on using the You’re Lovely stamp set. The flowers are colored with Pool Party and Pistachio Pudding for the leaves. The image is cut using the Deco Labels framelits and layered onto a piece of pool party also cut with the same frame lit. 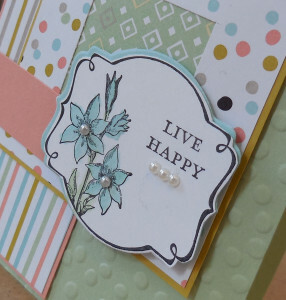 I trimmed around the stamped image just a little to achieve the layered effect! 6. The banner is cut from a 3/4″ piece of Crisp Canteloupe. 7. Last but not least, I embellished the center of the flowers with pearl jewels. After all, every card needs a little bling! The labels are attached with dimensionals to give the card some depth! Viola! Enjoy! Here is the link to the Mojo Monday site so you can see what others have done with this sketch!